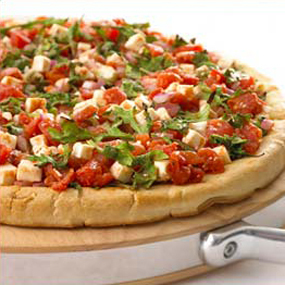 In a large bowl, mix Furmano's Italian Style Diced Tomatoes with Basil, Garlic & Oregano, onions and parsley. Mix gently to maintain tomato definition. On a large raised edge plate, pour olive oil and garlic. Dredge slices of baguette in olive oil to coat both sides. Place on a cookie sheet in the oven until bread toasts to desired crispiness. Top baguettes with tomato mixture and serve.